The name Florence Nightingale has become synonymous with nursing, so it is fitting that National Nurses Week wraps up on her birthday, May 12th. Her pioneering spirit has left a lasting legacy: Not only did she revolutionize the practice of patient care and emphasize the health benefits of proper sanitation; she also spearheaded social justice issues. One of her great achievements was the introduction of trained nurses into Britain and Ireland’s workhouses, ensuring that some of the nations’ most vulnerable citizens received quality health care. Some historians today think this innovation was a guiding light behind the establishment of the Britain’s National Health Service 40 years after her death in 1910. 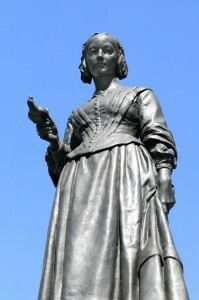 She is best known as “the Lady with the Lamp” who, day and night, ministered to wounded soldiers in the Crimean War. A popular newspaper of the time gave us the most popular—and poignant—image of Florence Nightingale. “…as her slender form glides quietly along each corridor, every poor fellow’s face softens with gratitude at the sight of her…she may be observed alone, with a little lamp in her hand, making her solitary rounds.” Her experiences during wartime made her an advocate for the sanitary design of hospitals, a development that continues to save lives around the world. Her name is attached to the Florence Nightingale School of Nursing and Midwifery, one of the largest schools within King’s College, London. This school, founded on July 9, 1860, was originally located at St. Thomas’ Hospital; back then, it was called the Nightingale Training School. A year earlier, she’d published Notes on Nursing, a textbook on nursing practice that popularized the profession. From the mortar and bricks of the hospital to the hearts and minds of the nurses inside its walls, Florence Nightingale has remained an agent of change in the medical community, and beyond.